You’ve heard of numerology, right? It has to do with numbers and their relationship to something else. Dreamers often add the ages of their children to arrive at hopeful lotto combinations. Few would marry on Friday the 13th, and many tall buildings completely shun a 13th floor altogether, skipping from 12 to 14 instead. Numbers definitely have sway, alright, and one number once had a mighty hold over me too. And that number was 7163. And the year was 1962. You see, I was a wet-behind-the-ears brand spanking new Novice Amateur Radio operator. Back in those days, Novice licenses were valid for only 365 days. You either buckled down, increased your code speed, and passed a General exam within a year, or you were rudely booted from the hobby. Hard to imagine that we treated our fragile newcomers with such lack of compassion back then, but that’s the way it was. Upgrade or find a new hobby. Oh, and there were other challenges too, such as power restrictions, mode limitations, and abbreviated frequency spectrum, but nothing, absolutely nothing compared to the greatest obstacle of them all. We second-class radio novices were rock bound. 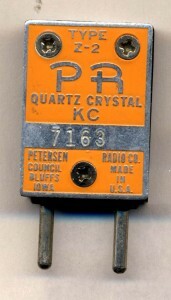 That’s right, we were forced to use a plug-in crystal to lock down our transmitting frequency to a single spot. And my spot was 7163. 7163 Khz, or 7.163 Mhz or just plain ole 7163 … that was the frequency I called home and where my CQs originated. And so it went like this. You called CQ, usually longer rather than shorter, hoping to snare a tuning ear, and then you listened yourself for a reply. But you rarely heard one, not on frequency anyway. What were the odds someone else would have your very same crystal frequency, right? And then you proceeded to tune your receiver, either up or down, in whichever direction felt lucky at the time, and you searched for your callsign coming back to you. And if it was a successful CQ, why sure enough there would be someone answering. And that station might be far removed from your calling frequency, because he too was likely hamstrung with the very same affliction that sickened all Novices – that insidious license restriction that called for crystal control. But we Novice class operators were nothing if not resourceful, and we quickly learned the drill. Call CQ. Listen. And if nothing is heard, start spinning that receiver dial as swiftly as possible, hoping to hear your own callsign coming back to you. And this worked in reverse too. You’d be scanning the band, listening for a CQ, and then you’d answer. And your crystal frequency might be a country mile from the station you’re calling, but you answered anyway, hopeful that the sender was as skillful at sleuthing out a reply as you’d become. And it didn’t take long to realize that the closer you were to the station you called, the better your odds at an answer. And sometimes the radio gods were especially kind and someone would answer your CQ from clear at the other end of the band, or a station you called would respond to you, even though your signals were separated by a vast difference in frequency. And so it was back in 1962. And my single greatest motivation for upgrading, aside from saving my license from expiration, was to enjoy the freedom known only to those lucky ones who transmitted wherever they wished. Previous PostVC3JUNO and the Canadians on D DayNext PostHow amazing is this wonderful hobby of ours?